Are you located in Gilbert and looking for a termite and pest control company? Look no more! With more than twenty years of experience, Varsity Termite and Pest Control in Gilbert focuses on delivering a precise termite pest control that will eliminate and prevent your bugs from invading again. Varsity Termite and Pest Control has licensed and insured experts that are skilled in the latest and best service methods on the market. We offer the best Gilbert pest control in ants, scorpions, bed bugs, spiders, cockroaches, mice, termites, and even pigeons. Our positive reviews in Google, Yelp and our A+ in Better Business Bureau shows how involved we are in Gilbert pest control. With just a call, we will thoroughly inspect your house to know what kind of pest there is and the type of treatment we will use. Once we are done, we will prevent them from coming back. Don’t hesitate to give us a call if you want us to inspect your home for any infestation sign. You won’t have to worry about your backyard since our products have low toxicity and are natural or organic based; it is safe around children and pets. 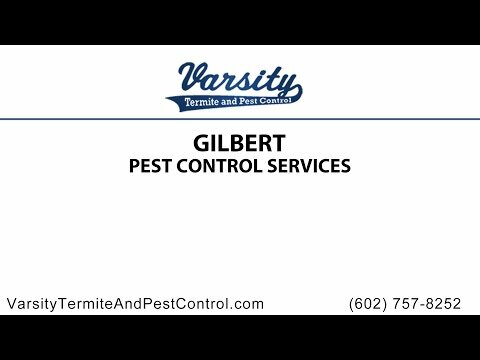 Varsity offers Gilbert Pest Control Services that work. No matter if you are dealing with ants, a termite infestation, nasty cockroaches or spiders, we can help. Our approach to pest elimination and extermination is proven, guaranteed and affordable. You don’t have to live with bugs. To learn more about our Gilbert Pest Control Services and to get started today, contact us at 602-757-8252 or visit us online at varsitytermiteandpestcontrol.com to learn more. Gilbert is one of the most family friendly towns in all of Arizona. It has beautiful parks, playgrounds, great shopping, fine dining and a charming historic downtown. Every Friday you can meet your friends at the food truck gathering, and shop the farmer’s market on Saturday mornings. In the middle of today’s hectic life, Gilbert is a laid back and fun community that emphasizes recreation and free time. However, not too long ago it was mostly fields and farmland. While there is still plenty of land that is farmed, there are also many unwelcome pests that at one point or another find their way into Gilbert homes. And when that happens you need a great pest control company that can take care of the problem fast and efficiently. You need Varsity Termite and Pest Control. Varsity has been a top rated Gilbert pest control company for over two decades. Our team has extensive experience in dealing with pests of all types. No matter if you are having a pigeon problems or roof rats, we can help. Our local family owned and operated business is proud of the excellent customer service we offer and the great reviews we get in return. Through honest service with integrity and pest control methods that actually work, our customer base has grown over the years. For effective and affordable pest control in Gilbert, there is no one better than Varsity. Call us today! We started Varsity over 20 years ago with the premise of providing top termite and pest control services at affordable rates. We want to help our friends and neighbors to get rid of pests that can pose a hazard to your health and destroy your home as well. By being local, we understand exactly what Gilbert pests you are dealing with. This is what makes us so efficient: our knowledge of the area, an insight into how homes are built and an intimate knowledge of the pests we help to get rid of. Throwing poison on pests is not effective if you do not understand how they live and reproduce. For effective pest elimination you need a Gilbert exterminator that knows all of the components. There are so many different pests that if a company offers a “one-size-fits-all” approach, you already know they have no idea what they are talking about. Here at Varsity our Gilbert pest control experts are licensed by the state of Arizona and have years of experience in the field and in dealing with different elimination techniques depending on the pest at hand. Regardless if you are dealing with ants, fire ants, spiders, black widows, roof rats, pigeons, bed bugs or any other loathsome critters that have found their way into your home, we have the right methods and tools to get rid of them. Honesty, integrity, and efficiency-that’s the Varsity way. With Varsity Termite and Pest Control, you are guaranteed to receive the fastest delivery in Gilbert pest control service. We take care of any infestation inside and outside your house without damaging any furniture or plants. With just a quick call, we will be with you in no time. You won’t have to worry about nasty termites ever again. Termites like to live in dark places between your walls or underground; we promise to take care of your pest with our termite pest control and make sure they never come back to damage your home. These little creatures are characterized by their long tail and deadly sting. We will eradicate your scorpion infestation and make sure they don’t make a nest again in your home. We have the best scorpion pest control and scorpion home sealing for your needs. With the best pest control services in Gilbert, we provide the security and safety your family needs from all the nasty little creatures that can invade your house. Varsity Termite and Pest Control’s owner Tony Kaufman brings over 21 years of experience to the table, ensuring that his company is more than capable of dealing with all kind of pests and infestations. As soon as you find any evidence of bugs living in your home, don’t hesitate to give us a call. You can contact us at 602-560-6021 to coordinate a thorough inspection of your house as quick as possible. As an honest and reliable pest control company, Varsity Termite and Pest Control makes sure to prevent the bugs for doing damage to your house. Varsity and Termite Pest Control is your best choice in Gilbert. Termite damage can be extremely expensive. Therefore, it is essential to discover and get rid of termites as early as possible. If you have been putting off having your home inspected for termites, you are out of excuses, because we offer a Gilbert termite home inspection for free. All you have to do is contact us and get it scheduled and the sooner you do, the better it will be for your home. Scorpions are another nuisance that is often found in Gilbert area homes and can be extremely difficult to get rid of. They do not typically respond to readily available pesticides, but need to be eradicated by an expert. We offer scorpion sealing and scorpion control so you can sleep at night. In Gilbert, AZ pest control is an integral part of maintaining your home. No matter if you worry about termites destroying your investment, or ants flooding your kitchen, the sooner you take care of the problem, the easier it will be to get rid of it and the cheaper it will be. Many homeowners attempt to fix it on their own. This rarely works. Instead it can worsen the problem if the pesticide used does not kill off the population. Oftentimes, the population will move or even spread more, making the situation worse. If you call for a Gilbert pest control technician now, he will still be able to get rid of the bugs, but it may be more difficult and more expensive. Cockroaches are hard to eliminate. They have been living on earth much longer than humans which is a pretty good sign that they are exceedingly hard to kill. If you are dealing with a roach infestation in your Gilbert home or office, contact us right away, because it won’t get better on its own. Instead you need a professional that understand the physical aspects and the life cycle of the roach and thus can properly eradicate it from your home. No matter what pests find the way into your home, we will get them back out. Contact us today to learn more about the comprehensive and effective Gilbert extermination services we offer.